BIAFRA: TRUMP’S INVITATION OF NNAMDI KANU (IPOB) ON HIS INAUGURATION; WHAT IS LEFT? 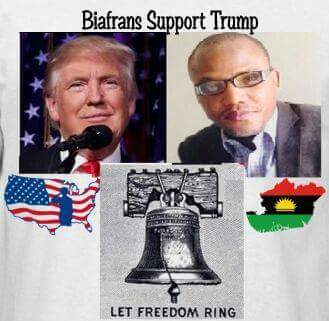 Do you need including ‘Biafra’ in Trump’s inaugural speech to know there is certainty that self determination which Trump had confessed is sacrosanct will be expressed through referendum in Biafra? The V.I.P slot given to Nnamdi Kanu but was represented by Deputy National Eastern Area USA Coordinator of IPOB shows there is hope and certainty of Trump’s 'unpredictability'. Buhari cannot deny that Trump’s invitation of Nnamdi Kanu thus snubbing Nigerian ambassador is a clear sign of mockery of the trumped up charges against him. If truly Nnamdi Kanu committed a crime or has constituted any form of a nuisance; there was no way he would be invited to Trump’s inauguration. If he is a felon as believed or accused by Muhammadu Buhari; the leader of the most civilized and law-abiding country of the world will not invite him. If Nnamdi Kanu has done anything contrary to any known law; USA will not look at him as someone worth giving a VIP slot in Washington. To continue to hold Nnamdi Kanu is nothing but foolishness and bigotry that would lead us all into a pit of war. On the side of Justice Binta Nyako; is she not ashamed over the legal nuisance she constitutes by being used to holding Nnamdi Kanu, at least she is more educated than Buhari who holds only common entrance certificate? You accused Nnamdi Kanu of treasonable felony but he is being invited to the greatest event in the world. Justice Binta Nyako has sheepishly followed Buhari’s order to ensure that Nnamdi Kanu is detained; yet in the world, Nnamdi Kanu is invited to join lawful, peaceful and great men of the world. The invitation given to Nnamdi Kanu simply passes a clear message; that the treasonable felony charge and unlawful society tag are nothing but barbarism. Donald Trump would look at Justice Binta Nyako and Muhammadu Buhari and say, what a world of bigotry and uncivilization, just because a man peacefully called for right to determine for himself, he was thrown into detention. Trump’s invitation of Nnamdi Kanu is clearly acknowledgement of the rare civilization Nnamdi Kanu has shown in his quest for freedom. There is no basis to continue to hold Nnamdi Kanu because what will come upon Nigeria will be immense unless they address Biafra agitation politically than incarcerating, killing and intimidating Biafrans. Holding Nnamdi Kanu has become a disgrace to the trial Judge and the Nigerian judiciary as a whole; snubbing Nigerian ambassador to US and inviting Nnamdi Kanu shows the sympathy Buhari has accrued for Nnamdi Kanu. Unlike Uwazurike MASSOB and Billie Human Rights that lie they have a seat in UN simply to deceive gullible Biafrans and extort money from them; the hard work of Nnamdi Kanu and the Indigenous People of Biafra got Biafra such international recognition or invitation, the President of America officially invited IPOB to be represented in his inauguration. I am the happiest person; the prophecy of Nnamdi Kanu that a Republican will be in power when Biafra will come propelled me to be the first Biafran journalist to call for total support of Donald Trump. The Indigenous People of Biafra against all odds supported him even when it looked certain that he would fail, Biafrans kept believing and fighting. Not only did they support him but fought relentlessly on the social media which was a deciding factor. Today, Donald Trump has recognized his comrades; what shall I compare to his heart of gold and passion of wolverine that never looks back. "Trump Team invited IPOB to be represented at the inauguration 20th Jan. IPOB Deputy National Eastern Area USA will be our VIP representing for this historic movement". The message came to IPOB media wing from Carol Munday; it was unbelievable when it was received but the reality was starring at us. Further investigation revealed that Candy Stallworth; another USA based Biafra activist was the primary contact for the representation. The invitation is a historic one; first of its kind in Africa, that people aspiring for right to self-determination were invited and the mother country leader vehemently snubbed. This is simply an act of sympathy; Muhammadu Buhari failed in everything; even in handling the Biafra agitation as he has continued to hold Nnamdi Kanu. The continued detention of Nnamdi Kanu is barbarism and against globalization which is the nucleus of civilization.